Granite countertops have become ubiquitous in kitchen over the past few decades. Most new homes these days still offer or come standard with granite in the kitchen, with some builders offering the stone as a vanity top in the bathroom. The natural stone industry has done a yeoman’s job of offering consumer after consumer a variety of granite colors and shades to please any taste and application. Why do people love granite? Once granite became more available for the common man, the love affair with granite blossomed and superseded our desire to design with marble, especially when homeowners and businesses discovered the durability and lower maintenance of this natural stone. This is why you need to fill up your containers with a number of granite options so those who visit your slab yard will have an assortment of stones to view. 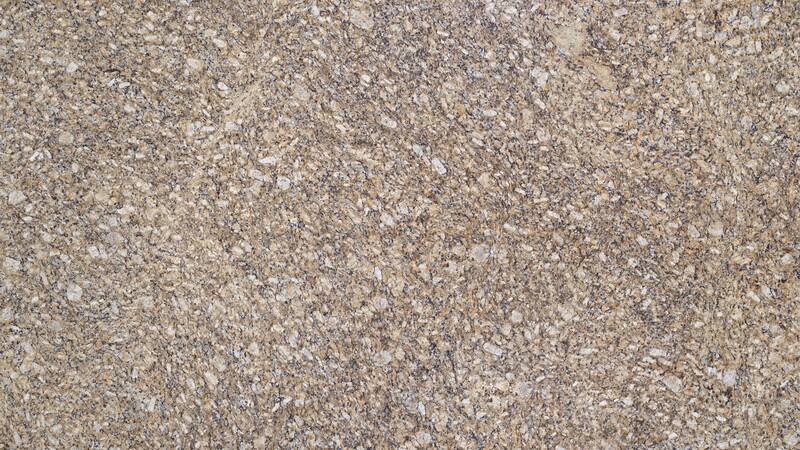 Try a bundle of creamy gray with brown-flecked and veined Colonial Gold granite. Why is granite so popular as a kitchen countertop? Granite has the honor of being the densest natural stone known to man, meaning it can withstand the busiest of kitchens. Granite is scratch resistant, stain resistant and heat resistant. Acidic substances like fruit juices, wine and lemons will not easily penetrate granite as easily as marble. Homeowners are aware of granite’s durability so be sure to have a great deal of granite slabs in your inventory; if not, the consumer will go elsewhere. Stock white granite because all white kitchens are trending now. Is granite hard to maintain? Most natural stone is easy to maintain. For everyday cleaning, a granite countertop cleanser will preserve the luster and beauty of granite and keep kitchen countertops looking like new for years to come. Plus, your stone color will present more richness and vibrancy with a cleanser made especially for granite. Try Mr. Stone Granite and Marble Countertop Cleaner, which also contains a bit of sealer. Now that’s the million dollar question in the natural stone industry. Many types of granite are impervious to water and may not require regular sealing, however other types of granite have shown to display more porosity. In general, to be on the safe side, granite should be sealed twice a year. We recommend Mr. Stone Superior Zero Unltimate Stone Sealer. Marble and granite slabs vary from quarry to quarry. Know your stone and educate the consumer so their prized possession leads a long and beautiful existence. Pour a little water—in an inconspicuous area—onto the countertop. If it absorbs right away, your granite is porous and needs to be sealed on a regular basis. If the water is still sitting atop the counter in a half hour, less sealing is necessary. Will a sealer protect the surface of my granite countertop? Topical sealers protect the surface of the stone, while impregnator sealers protect the stone from staining beneath the surface. Both protect from staining; topical sealers need to be removed before applying a new coat; impregnators do not. Be sure the product is made for natural stone. Visit Mr. Stone.com to view your options. Can a small chip in my granite be repaired? Small chips can be repaired at home with the Granite and Marble Chip repair kit from Mr. Stone. Homebuyers need to understand that very heavy objects may chip granite even though it is about as durable as natural stone gets. What happens if my granite does stain? If a dark discoloration is apparent on your granite from an unattended spill, fear not. There are products that can literally lift the stain from your countertop. Try DuPont StoneTech Countertop Stain Remover from Mr. Stone. Marble.com installs countertops and places seams in the most discreet ways possible. Seams are usually placed near the sink. Any natural stone like marble and granite can scratch. Granite is highly scratch resistant, but not scratch proof. Always use a cutting board. Besides, using your granite countertop as a cutting board will dull your knives. Again, Slabmarket carries a number of different granite stones that will fit the style and needs of anyone coming to your slab yard. Fill you container with a bundle or two of granite slabs like Giallo Ornamental granite, which offers a creamy white background and gray speckles throughout the stone. It has a neutral and consistent granite pattern that many homeowners adore in their kitchens.